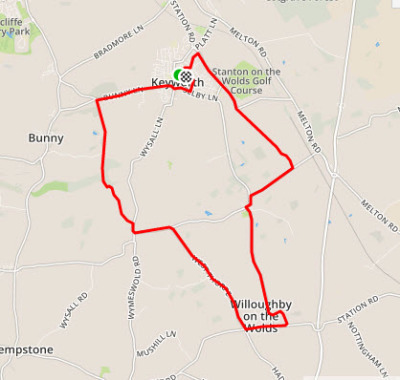 A deceptive half marathon course which appears to be quite hilly but fast times are possible if you get good weather and pace the run well. The event takes place in December with every chance of a cold and wet day. 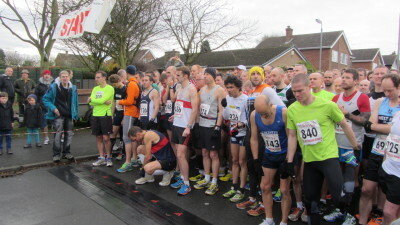 The course is 90% on country lanes with a short section on a main road at 6-7 miles and the final mile is on pavement and through a housing estate to the finish. Some roads can get slippery with leaves and farm mud, and if it is cold, there is a risk of frost and ice on some of the sections. Generally the roads are quiet and running on open roads is safe. Feed stations are well placed from 3 miles onwards. 1) The start is downhill but quite narrow and has a tight right turn before you hit the first climb out of the the town. Although not very long or steep, you can go off too fast here so take your time to settle into pace slowly. 2) The next 2 miles are downhill and you will get carried away with the pace. It will feel fast and very tempting to push too hard too early. Use it as free speed and back off the effort. 3) The steep climb. It climbs, then climbs again and seems to go on forever. Even when you reach the top, there are still a few hundred metres to go. The race should start at the summit, not at the bottom. 4) After the 5 mile point, you start a steady climb that goes on for the next 2 miles. It never gets steep but will make you work harder than you would like to. Don't push too hard here if you start to slow. 5) Between 7.5 and 9.5 miles, you have a gift of a downhill run. This is where you can make back time and push the pace. There is a feed station near the bottom. 7) From mile 11, there is a long drag on a country lane back to keyworth. It is worth pushing this harder than other climbs as the next mile is downhill with time to recover before the finish. 8) The final mile is a little bit of a sting. A few short climbs through the housing estate need to be attacked hard as the last 200m is downhill to the finish back at the school.